Even this secret keeper… Tim Chung. Silence can be golden & a picture can state 1,000 words. Both occurred in less than 24 hours. When confronted about the possibility of being the father of Kylie Jenner’s daughter, Stormi, Tim Chung merely smiled & trudged his merry way. Rumors gathered more steam when photos of Tim, Stormi & alleged father, Travis Scott were released. Clearly, Stormi resembles Kylie’s former hot bodyguard. 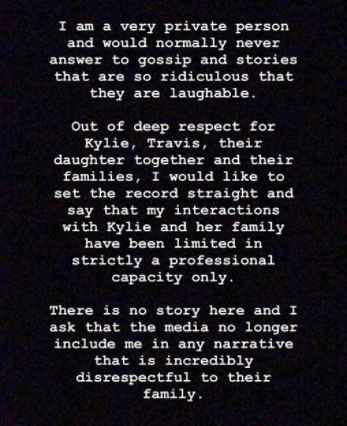 Social media dissected the photos of the 3 & concluded Jenner certainly lived up to the Kardashian’s bloodline - a scumbag. Until paternity test results are confirmed, the identity of Stormi’s father remains uncertain. Climb on The Family Tree below & share your thoughts about My Nephew Tim Chung’s denying situation! May 12 OMG… Azealia Banks Skull Drags Cardi B!!! Jan 9 Kylie Jenner Goes Off Grid During Pregnancy!! !